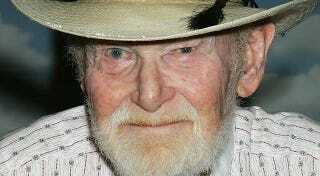 Filed to: Harry Carey Jr.Filed to: Harry Carey Jr.
Harry Carey Jr., an actor best known for his work in Westerns, died Thursday at the age of 91. Like many long-lived character actors of both silver and small screen, he was nothing if not prolific, and it's likely that anyone who watched much TV since the '40s managed to see him at some point, somewhere. Why, just as a guess, you might remember him from his military and lawmen roles: Cpl. Morrison, Capt. Gregson, Capt. Ward, Sgt. Shaker Schuker, Trooper Travis, Trooper Daniel "Sandy" Boone, Trooper Smith (uncredited), Major Jim Blythe, Marshal Fred White, Lt. Chuck Roundtree (uncredited), Lieutenant Vaughn, 2nd Lt. Ross Pennell, Lt. Ord, Lt. Hudson (uncredited), Lt. John Pritchett, Cpl. Peterson, District Ranger Frank Deane, Deputy Lee, Deputy McCafrey, Deputy Sheriff Will Masters, Sheriff Pike, Sheriff. No? Well, perhaps you remember Carey best from his red-blooded American roles: Cliff Eastland, Ralph Hunt, Griff Rhys, Dice Dawson, John Tarwater, Cort Hayjack, Ortho Clegg, Wally Finnegan, Joe Pogovich, Fitz Bragg, Dwight Eisenhower, Snappy Tom, Jimmy Biff, Arley Stamper, Cowboy (uncredited), Taxi Driver (uncredited), Bartender, Poker Player, Saloon Old Timer, Cashier, Prospector, Ellie's Father, Pa Traven, Grandfather Cross, Tanner, Bert, Barney, Dobie, Dumper, Dusty, Anderson, Mr. Anderson, Hank, Harry, Red, another Red, Johnson, John (uncredited) and, in Rio Bravo, Harold (scenes deleted). Regardless of your favorite Carey character, the sports world will best recall his work as Winslow – Olympic Team (uncredited) in Gentlemen Prefer Blondes and as player in dugout in a 1962 TV drama called Flashing Spikes, in which Jimmy Stewart starred. Of course the sports world can be said to include this guy, so it's not at all clear that the sports world has a clue.